This is the first year I have really fallen for Kenyan coffees, with most of the Kenyan’s having tons of rich fruit flavors, great acidity, and very well balanced for brewing and espresso. A few years ago, Kenyan’s were primarily much more delicate and nuanced and less espresso friendly; it seems Kenyan and Ethiopian coffees have switched roles this year, since it’s many Ethiopian’s that are drinking far lighter and nuanced. So, this last month’s worth of coffees have been really enjoyable with three Kenyan’s, a Ethiopian, and a blend from Heart Roasters, and an unexpected naturally processed Ethiopian thrown in for good measure. Last cup of Kenya Kaguyu AA today. This coffee needs a good amount of rest but makes a fantastic pour over at 23g : 380g in 2:30 - 2:45 with 203*F water. Very dynamic, balanced, sweet, creamy, and dreamy. Kenya Gachuiro AB is next up! Alas, it looks like this coffee is no longer available from Heart, so I’ll keep this brief. I didn’t get to try this one as espresso, but with a good amount (7+ days) of rest, it made fantastic brewed cups on the V60 at 23 grams in to 380 grams of water in 2:30 - 2:45 using 203*F water. This was part of Heart’s Sample Pack #2. Kenya Gachuiro AB from @heartroasters was good as a pour over but fantastic as espresso with lots of sweet tropical fruits and very balanced acidity. Preferred shots were 18g (in 18g vst) : 40g out in 27-29s including 2-3s of preinfusion, 201*F.
As stated above and in last month’s post, I just ordered two of the sampler pack boxes to get a full pound of each for a slight discount to 12 ounce retail bags. This one was described as having notes of Concord Grape, nectarine, and kiwi, and comes from Nyeri region of Kenya. This one made a great pourover but was brilliant as espresso with lots of sweet tropical fruits and great acidity. My preferred shot recipe was 18 grams in an 18 gram VST basket to 40 grams yield in 27-29 seconds including 2 seconds of preinfusion, using 201*F water. This coffee is still available for $20 for a 12 ounce bag or part of their sampler pack #2 here. 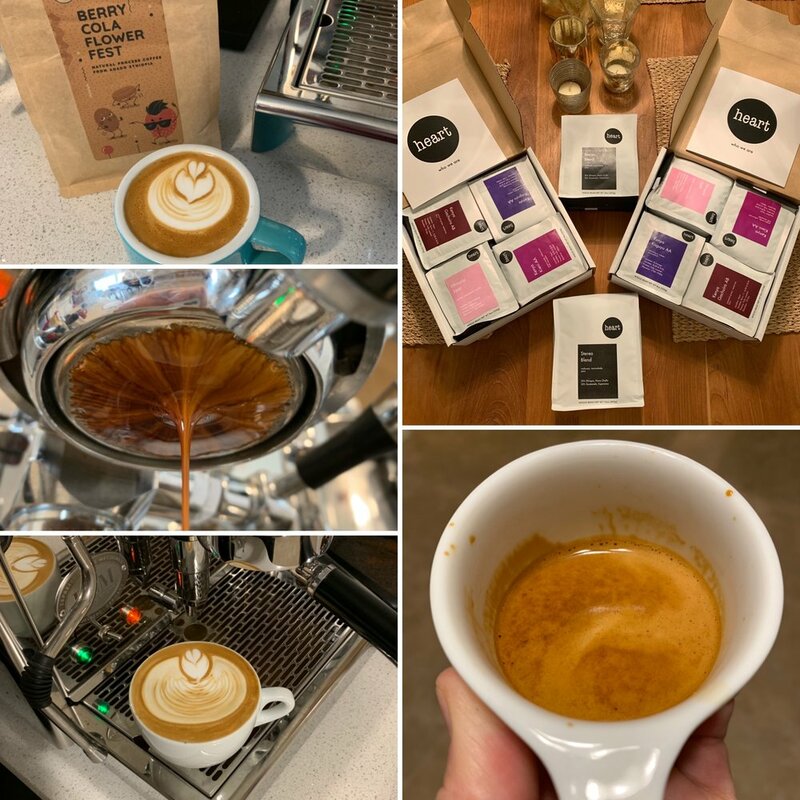 I had a little bit of help with this one with Heart posting a their recommended shot parameters for a dense “face melter”, read: syrupy intense ristretto shot. They recommended dosing 23 grams in a 22 gram ridgeless VST basket to 36.1 grams out in 26 seconds here. Dialing in this coffee as espresso actually inspired my recent #sprosunday live posts on Instagram, where I have been live dialing in a new coffee each Sunday morning and talking through the process as I go. I don’t have a 22 gram ridgeless basket but I do have 18 and 20 gram ridged VST’s, so I divided out their dose to yield to get a target brew strength and started trying to hit their proportional parameters, dosing 21 grams in a 20 gram ridged basket to 33 grams out in 26 seconds. This coffee needed a much coarser grind than the Kenyans, so I started of pulling really long and tight shots. And I actually ended up preferring them at that end of the spectrum, finding it easier to underextract when running the shots as fast as 26 seconds. I ultimately settled on 20.5 grams in a 20 gram VST to 30-32 grams out in 33-35 seconds with 3s of preinfusion and 203*F water. This coffee was also great at a 1:16 ratio through the V60, finishing in about 2:45. This coffee is available for $18 for a 12 ounce bag here. #sprosunday with my second shot of the day using Kenya Kieni AA from @heartroasters check my live story from earlier for the first shot. Based on taste, I went coarser/faster on this one: 18g : 36g in 25s and I think it could be pushed a little further by using line pressure only at the end of the shot. I’ve had a few Kieni coffees this year and they have been excellent, so I was interested to see how this one compared, notably to the Coffee Collective’s espresso roast that was part of the La Marzocco Home Subscription. That coffee I found doing an extended preinfusion and really pushing the shot made for a blackberry syrup like espresso that was divine. I again found this one to be really tasty with lots of grape and dark fruit sweetness with a milk chocolate like body and backbone. I did kind of a lever profile with this dosing 18.2 grams in an 18 gram VST basket with 2 seconds at line pressure preinfusion, which is about 2.5 bar for me, 23 seconds pump on at 8 bar, and 3-5 seconds back at line pressure for 37-40 grams out using 201*F water. I tried this coffee with milk, and it holds up in a cappuccino just fine, though I really feel like it’s not doing it much justice since it’s so good by itself. I also enjoyed brewed cups in the Hario V60 using a slightly weaker 1 : 16.5 ratio brewed in 2:45 using 202*F water. This coffee is a good example of why Kenyan coffees have been so good this year with the rich dense sweetness and plenty of body as compared to the lighter/thinner crops of year’s past. This coffee is available for $19.00 for a 12 ounce bag here and also part of Sample Pack #2. I bought these coffees just before Thanksgiving in preparation for holiday company, and bought 2 pounds for Stereo for all of the expected lattes for company. Stereo has always been one of those great go-to blends for me; great as a straight shot, works well with milk, and can be brewed. This iteration that’s 50% Ethiopia Nano Challa and 50% Guatemala Esperanza hits all of those boxes. It is admittedly not the most dynamic or interesting coffee out there with this current blend, I think I would prefer more fruit notes, but it works well in all scenarios as a go-to crowd pleaser as planned. I pulled shots with it through multiple grinders and multiple machines (a single group Slayer was the other) and found 1:2 ratios in the sweet spot for my liking, dosing 18 grams in an 18 gram VST basket. The flow profiled “Slayer style” shots seemed to be a bit more dynamic and interesting, doing a true pre-brew for 15 seconds, plus full pump pressure for another 25 seconds with optional tapering brew pressure at the tail end of the shot. I don’t know if could call out any specific notes other than it’s sweet, good, balanced coffee, and really that’s about ideal for a reliable house blend. Stereo is $19.00 for a true pound (which kudos to Heart for) here. #sprosunday action with the @versalab_m3 and @slayerespresso single group. This Ethiopian from @pair.cupworks was today's #sprosunday live coffee, check out the live story for more info. I tightened the grind after the live post and this one is coming along nicely with a lot of berry sweetness and floral nuance. An unexpected but very appreciated gift from a good friend came in the form of this naturally processed coffee from a local micro roasters out of Tempe, Arizona. I’ve been wanting to try this new roaster out, so this was a great surprise. The packaging and descriptors on the bag certainly had me intrigued and the very lightly roasted coffee was good as well. Roasting in only micro sized batches with 8 ounce bags, this coffee is about as light and nuanced as you could imagine for a naturally processed Ethiopian coffee. Berry flavors and aromas were still very present with subtle floral nuance in the aroma and finish. I pulled shots and brewed at pretty traditional ratios, 1:2 for espresso and 1 : 15.5 for brewed coffee, using 203*F water and slower brew times to counteract the light roast profile. This coffee was $11 for an 8 ounce bag and appears to be currently sold out but they have others available after the new year and exciting things coming. I just received and am just cracking into a shipment from Brandywine Coffee Roasters. This roaster, which gets a lot of attention due to their creatively and beautifully designed bags, is one I’ve been meaning to revisit and I always like that they have so many coffees available. Colombia Monteblanco Purple Caturra is first up (this one doesn’t appear to be on their site anymore), but it is followed by the naturally processed version of the same coffee (which is unusual for a Colombian coffee), along with Kenya Gaturiri AA. Brandywine’s coffees have always been thoughtfully roasted and of good quality in the past, so I’m looking forward to cracking into these. I don’t have plans for what roaster to order from next, so if any of you have something you feel I should look into or check out, please comment below or send me an email. Thanks as always for reading, and hope you have a great New Year.